Until the advent of the X-29 research aircraft in 1981, the XP-50 was the only aircraft ever requested by the US Army/USAAF/USAF. The aircraft was basically the XF5F-1 with a nose gear and powered by Wright 1820s. The aircraft was meant to be a competitor to the Lockheed XP-49, which was based on some highly experimental in-line engines. The XP-50 performed better in all respects to the XF5F-1, much of that thanks to the turbocharged engines. Unfortunately, these engines were to be the demise of the XP-50 program, for after the explosion of one in flight and the subsequent loss of the aircraft (the pilot baled out safely). The Army then proposed an improved version, the XP-65 with a similar version to be developed for the Navy. In the end, the Army dropped out of the program and the Navy went on to build their version which eventually became the F7F Tigercat. Not really sure who did the original molds for this kit, but it is a one-of-a-kind. 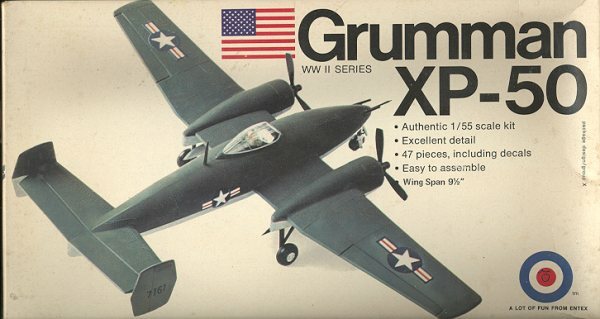 No one else does an XP-50 in ANY scale. How this came to be 1/55 scale is beyond me. Maybe they didn't have enough money for a full 1/48 version! Anyway, as you can see by the images, it is molded in a lovely greenish plastic. I know that this kit is at least 25 years old if not more. There are none of the usual working features or rivets that one usually associates with these old kits. There is also no interior, no wheel well detail and no engine detail. You do get a couple of bombs to mount under the wings should you decide to add them. The landing gear looks a bit stalky, but this is perhaps due to the small wheels. The props are also a bit on the small side as are the engine cowlings. If you recall, this is very similar to the XF5F so should have larger diameter nacelles. The transparency is nice and clear and well molded. It will allow you to see the pilot head and blanking plate very nicely! The instructions are a single page with an exploded diagram showing where the parts fit. It is adequate to the task and that is about it. No real painting information is given other than the box art. 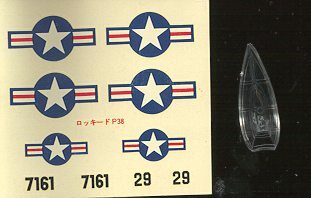 The decals are totally spurious and are marked 'P-38'. This aircraft should be overall aluminum with early roundels (stars with the red dot) and tail stripes. This is a kit only for the collector as it really isn't a serious model at all. More of a toy than anything else. Trying to make it into a viable model would only be an exercise in frustration. 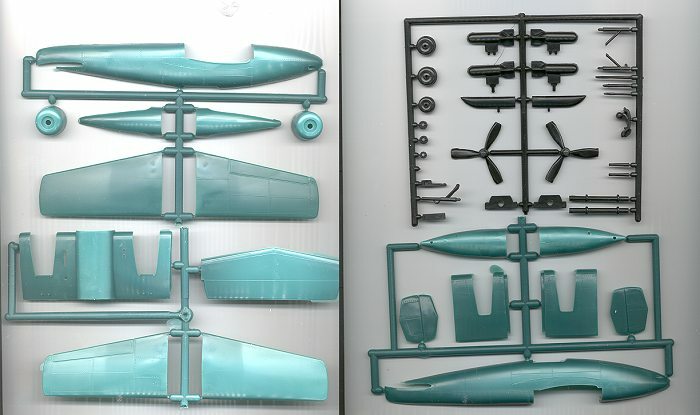 It would be much easier to convert the second XF5F boxing with the longer nose.